à bas le ciel: Yes, Aristotle really meant "Election By Lottery". 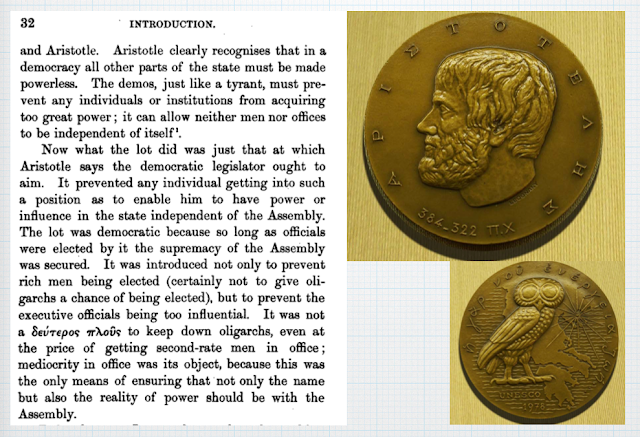 Yes, Aristotle really meant "Election By Lottery". My recent video titled, "Aristotle's philosophy (in/and my life)" resulted in a few gasps of amazement amongst my Patreon supporters. Can it be that "election by lot" really means a sort of lottery? Could it be that I'm misreading something somewhere along the line? Note the text quoted in the image above, but, also, to quote the lowly Wikipedia: "The Athenians believed sortition to be democratic but not elections and used complex procedures with purpose-built allotment machines (kleroteria) to avoid the corrupt practices used by oligarchs to buy their way into office." And yes, indeed, you will find, "sortition" is another word for election at random —by lot or lottery.